“The concert was about as exciting as waiting for a bus,” ejaculated deflated Pumpkins fan Kimberley Nimpe, 50, a mixed martial arts Torontonian. “I mean the Lawrence East 54 bus, specifically, which always arrives aboot two and an half hours later, to be exact,” she went on. Corgan, 60, then quit the Pumpkins, leaping off stage as Nimpe’s off-key comments were beamed directly into his earbud headset via the magic bullet of social networking and Twitter. 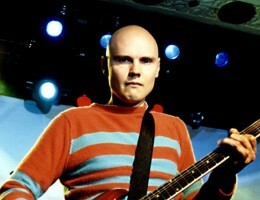 Corgan’s quit fit has since sent ripples through the netherworld of Frankenbands – bands whose original members add up to less than a baker’s dozen, minus the remaining five, equaling one. Let me try that again – as news of Corgan’s quit fit went viral, other bands you wish would just go away, with just one original member, have been shock-rocked, triggering an Internet tsunami of quit fits in bands with such exotic names as Pearl Jam, Hole, and Guns N’ Roses. “The outpouring for me to quit Guns has been huge,” said former GN’R singer Axl Rose, reading from a prepared statement at Denny’s. “So, I quit,” he went on. It is uncertain whether the band, which changed its name to N’ a few years ago, will continue without Rose, but fans can continue to hope. Likewise, Wilco lead singer Jeff Tweedy tweeted that he would be leaving the band, as he now realized the real Wilco had ended with the band’s last half decent album Yankee Hotel Foxtrot, in 2001. “Frankenbands are waking up, and, thanks to social networking sites like Twitter and Facebook, just like the Arab spring revolutions, we’re seeing a real change that we can take credit for just by saying we made it happen,” informed Greg Baz, 19, a loans officer at CitiBank Hong Kong. Music critics around the blogosphere blame the advance of the vuvuzela for tempting the last remaining original band members towards lucrative solo careers. Will music be dead then, too. This entry was posted in Thinking Man's Rock and tagged democratic peoples' republic of ikea, dj salinger, frankenband spring; billy corgan quits smashing pumpkins, green day, guns n roses, hole, jazz man, jeff tweedy, N', the brutal times, wilco. Bookmark the permalink. finally! he was ruining that band from day 1. acshully, i’d like to see just the instruments onsatge without the musicians – they’re just getting in the way.